Being a well established enterprise, we are extremely efficient in trading, exporting and supplying an excellent array of Tavegyl Tablets that is stringently tested by our skilled quality controllers on various quality parameters to meet the needs of our clients. Our customers greatly rely on the offered range for its associated features like accurate composition and purity. Apart from this, the offered product is available at pocket-friendly prices to our clients from every nook and corner of the nation. 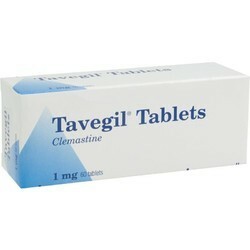 In order to meet different requirements of the customers, we have added Tavegyl Tablets in our product-line. This tablet is processed at our vendors processing unit, making use of high-grade ingredients and composites. Furthermore, it is suitably packed in a blister pack, thereby ensuring safe transit towards customers' premises. Clindamycin Phosphate is a topical (applied on skin) antibiotic drug that fights bacterial growth on the skin. It is prescribed for the treatment of severe acne.